Back in June I took a weekend trip to LA. 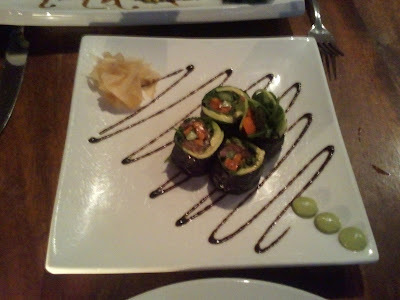 Top on my list of local vegan restaurants to try was Native Foods. Perusing their website in preparation for my visit I was surprised to learn that there would be three locations opening in Chicago in the fall. 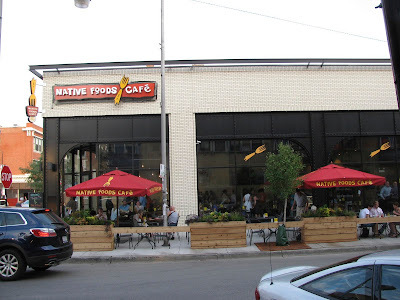 I decided to postpone my visit to Native Foods and wait for them to come to me. The two month wait is over, the first Chicago location opened in Wicker Park today! 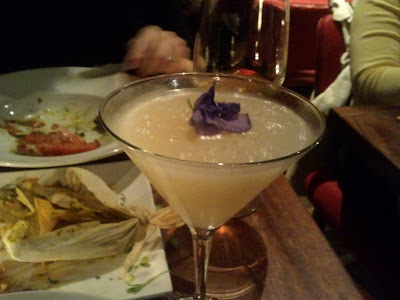 I didn't have to wait until today though, I was fortunate enough to be invited to a pre-opening dinner on Friday night! 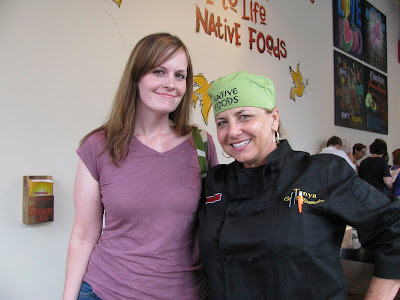 Our dining experience started out with a greeting from Chef Tanya herself at the door! Starstruck, I expressed my excitement to meet her and asked for a photo, to which she replied, "Oh, a groupie!" Guilty as charged, vegan food nerd to the core! We had a nice chat before getting in line to order. While we were in line we were offered samples of their Lavender Lemonade and Watermelon Fresca. I am not a big fan of mint, watermelon, or lavender, so I did not think that I would like either of these. To my surprise I loved them both! 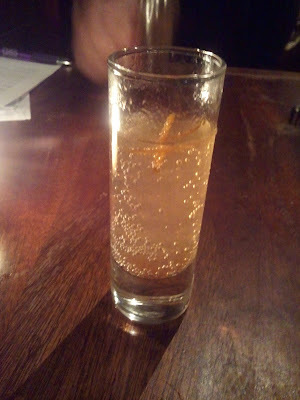 They were light and refreshing, and the flavors were very complimentary and not overpowering. 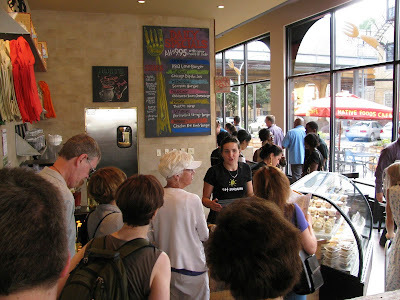 When we reached the counter we were encouraged to order several things, all on the house, so that we could get a good taste of their offerings. How could we resist with a menu like this? 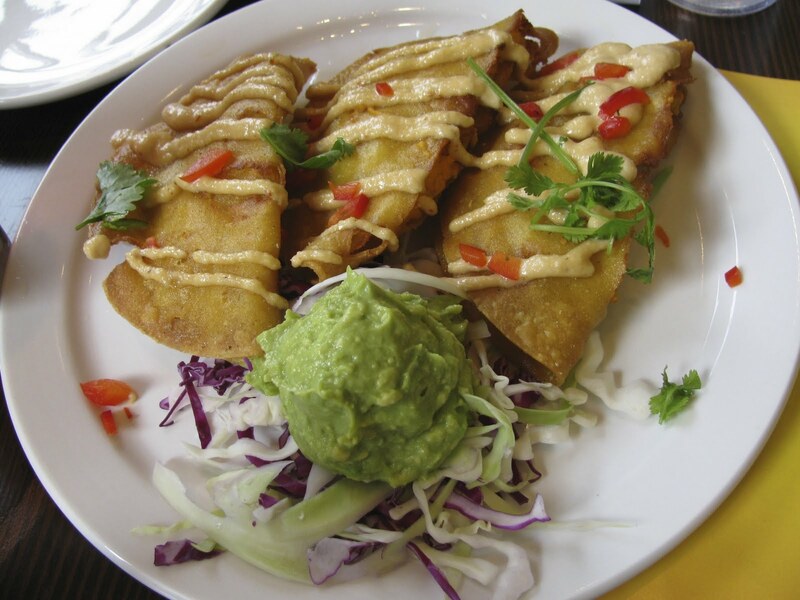 For our starter we chose the Sweet Potato Taquitos. We loved these! The dish comes with three fantastically crunchy corn tortillas stuffed with coconut mashed sweet potatoes and topped with chipotle crema. 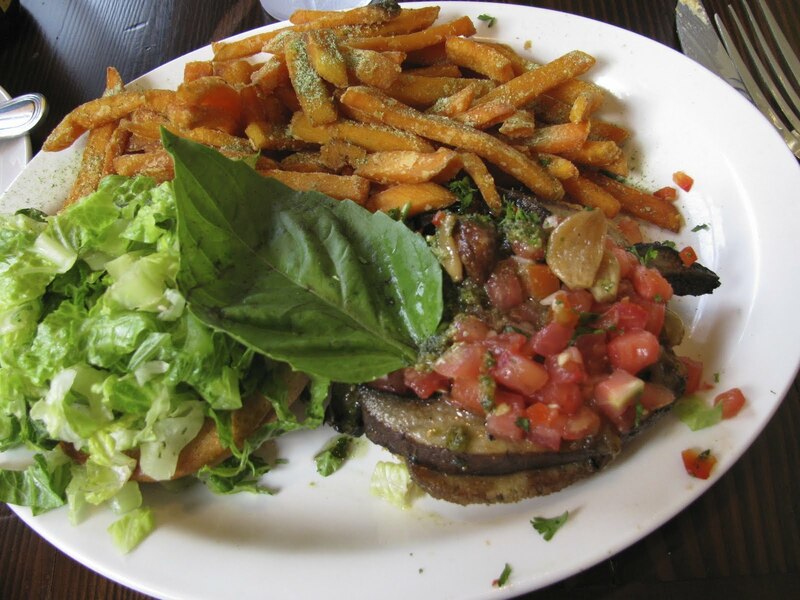 For my main dish I chose the Portobello and Sausage Burger with a side of sweet potato fries. This burger is made up of grilled portobellos, sausage seitan, caramelized onion, pumpkin seed pesto, roasted garlic, pomodoro, and vegan mayo. The pumpkin seed pesto and roasted garlic really pop in this sandwich, which just happen to be a couple of my favorite flavors on earth! 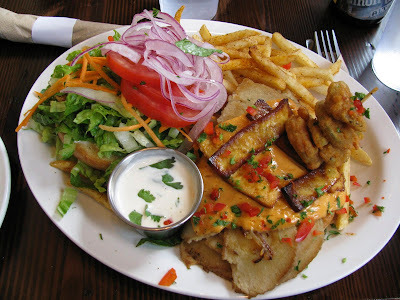 The sweet potato fries were tasty too, but a bit too heavy alongside the burger for me. Next time I'll try it with the steamed kale. Steve's entree was the Oklahoma Bacon Cheeseburger. This was our favorite dish of the night! It might be hard to figure out what all the awesome is in this picture, so let me break it down for you. On the left side of the plate is the top half of the sandwich: bun, lettuce tomato, onion. On the right side of the plate is the bottom half of the sandwich: sliced seitan, bacon, melted "cheddar", caramelized onion, battered pickle chips, and bbq sauce. Everything about this sandwich is amazing and perfect, but we both agreed that the cheddar stole the show. Chef Tanya, please give me your recipe!! 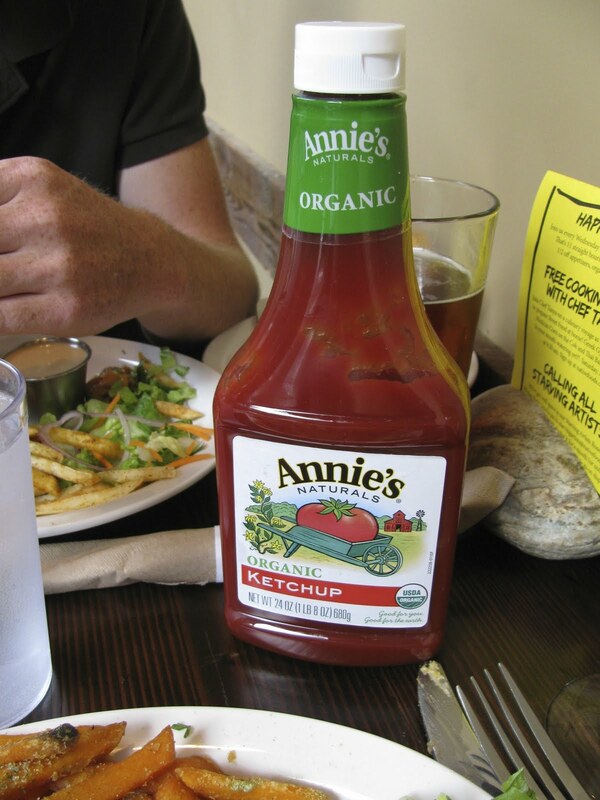 I got a kick out of being served Annie's ketchup--it was the first time I have seen an Annie's product at a restaurant. I prefer my fries without the high fructose corn syrup, thanks for that Native Foods! It was pretty foolish to think we'd have room for dessert after all of that food, but thankfully our selections were served in to-go cups. We took a single bite of each and tucked them away for later. 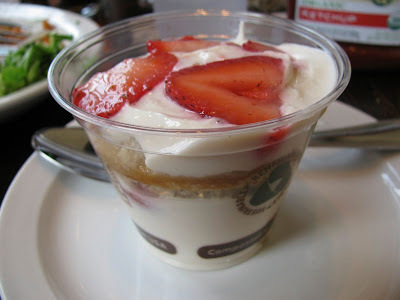 My choice was the Strawberry Shortcake Parfait. I couldn't resist, strawberry shortcake is a childhood favorite of mine, and something I haven't had since going vegan. What a treat! I was very impressed by how close this vegan and refined sugar-free version tasted to what I remember from childhood. I particularly loved the fluffy layers of almond creme. Steve made the winning selection again with the Peanut Butter Parfait, but how could you go wrong with a dessert featuring whipped peanut butter filling? The cookie pieces are actually crumbles of Native's boogie bars, a banana bread made with oats, coconut, and almonds. So creative and delicious, and most definitely healthier than the average parfait. 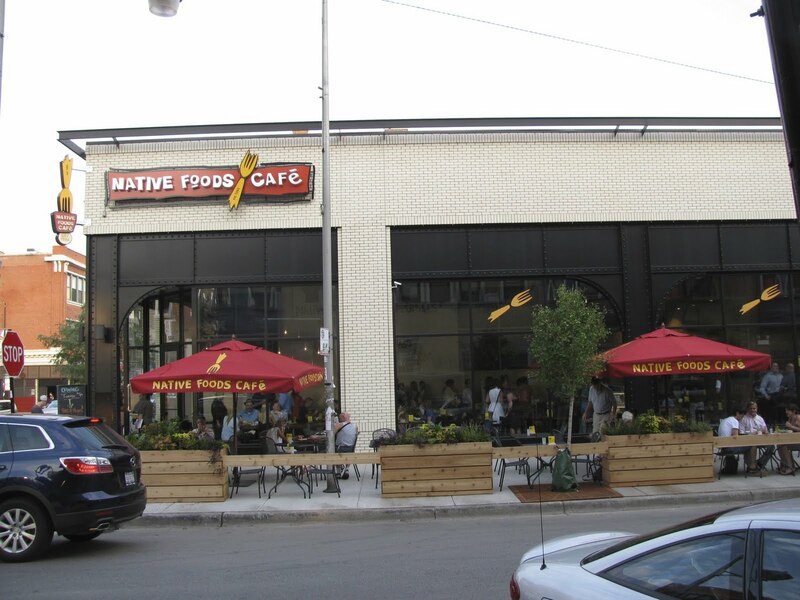 We welcome our new friends at Native Foods to Chicago with open arms! Our first visit was simply amazing, and we haven't stopped talking about it since. Our next visit is officially on our calendars, so we'll see you really soon! (We may or may not have even decided what we are going to be trying next time [I'm looking at you, Soul Bowl]). Thanks again for your hospitality and great eats! I tend to shy away from couscous. I blame a college friend who turned her nose up it saying, "Couscous? Sounds too much like goose poop." Ever since, whenever I see couscous that memory comes to mind (and perhaps will for you now, too. You're welcome. [Wow, this post is certainly off to a questionable start]). All joking aside, couscous has just never been very exciting to me. The standard itty bitty couscous may have never excited me, but I just discovered that his big brother Israeli couscous does! It is not just me, I served this salad at a picnic and received many positive comments and requests for the recipe. Confirmed crowd pleaser! 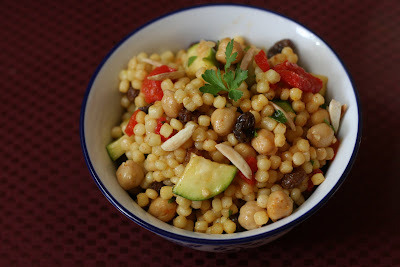 Trust me and give your favorite summer pasta salad a makeover with Israeli couscous, or better yet, try this salad. This recipe is inspired by a store-bought version that my dad served at his Memorial Day picnic. The combination of textures and flavors is just right. Light citrus and a touch of sweetness, tied together with the warm flavors of cumin, saffron, and cinnamon. The flavors are even better the second day, so I encourage you to make this a day ahead. The plump beads of couscous hold up very well overnight, something that I wouldn't expect as much from the itty bitty variety. Heat 1 tsp olive oil in a large saucepan over medium heat. Add garlic and saute for 3 minutes. Add dry couscous and toast for 5 minutes, stirring frequently. Stir in vegetable stock and saffron and turn up heat to bring to a boil. Lower heat to a simmer and cover. Cook until all of the liquid has been absorbed, about 10 minutes. Toss with 1 tbsp olive oil and set aside to cool. Prepare mix-ins and whisk together dressing ingredients. Wait until the couscous has cooled, and then gently toss with the toppings and dressing until well incorporated. Season with additional salt and pepper to taste, and fully chill before serving. For best results chill overnight to allow the flavors to meld--in which case keep the almonds separate to prevent them from softening. The salad may also benefit from an additional tablespoon of lemon juice and olive oil in the morning, as most of the dressing will be absorbed into the couscous overnight. Test first to see if this is necessary. Thanks to everyone who entered the giveaway to win a copy of Vegan Desserts! 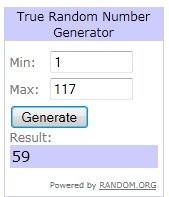 A random number generator selected lucky number 59. Congrats to Carrie of Moves 'N Munchies! Email me your address and I'll get your book out to you right away. If you have been reading my blog since the title ordinary vegetarian actually fit me, you might remember my first vegan baking experience. Armed with a copy of Hannah Kaminky's My Sweet Vegan, I was well equipped for my task. Since then I became vegan, and my interest in vegan baking immediately followed. Hannah has been a favorite source for vegan dessert recipes through both her blog and e-books ever since, so you can imagine how excited I was to learn about the release of her second cookbook, Vegan Desserts! A worthy collection of sophisticated yet approachable desserts, conveniently divided by season. The book features over 100 recipes, each accompanied by the most tempting full color image photographed by Hannah herself. I have had my copy for two months now, and have already enjoyed several recipes. I cheated and baked from the winter section first since I had all of the ingredients for the Irish Crème Squares on hand. This is definitely a grown up dessert, unless your young ones enjoy the flavors of coffee and whiskey. As for myself, I couldn't resist! The coffee and whiskey infused cream layer is perfectly complimented by the cocoa almond crust. Hear, hear for boozy desserts! For my first springtime selection I went with the Marbled Chocolate and Zucchini Bread. This dessert bread is a real treat. 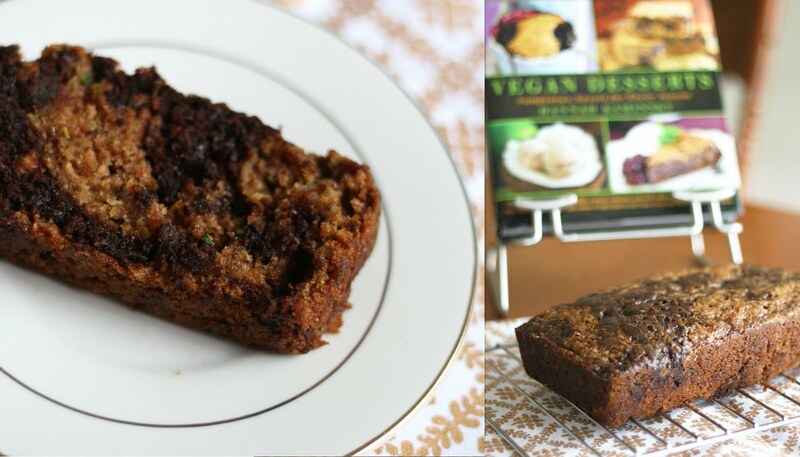 It is sweet, moist, and cakey--sweeter than more traditional zucchini breads I have tried. This was my first marbled baked good, and I was so pleased with the way that the beautiful swirls of chocolate turned out. I am anticipating having too many zucchinis on my hands soon, and looking forward to putting them to good use in more loaves of this bread! I sampled a second dessert from the spring section -- the Coco-Nut Macaroons. Coco-Nut is hyphenated because the Nut is actually crunchy peanut butter. The peanut butter flavor is second to coconut, but is undoubtedly the oomph that pushes these macaroons over the edge. That and the chocolate dipped bases! These were perfectly dense, chewy, and rich--honestly the only coconut macaroon recipe I'll ever need. I mean, coco-nut! Moving on from springtime delights to a perfect summery treat (and the cutest name in the book! ), Mango Tango Cupcakes. 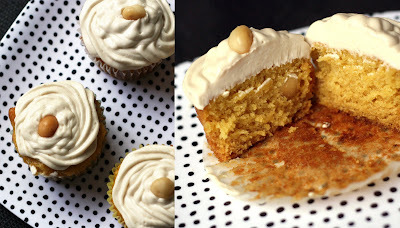 This inventive cupcake has two pureed mangoes in the batter, along with a helping of chopped macadamia nuts. If you aren't sold on that alone, then the rum cream cheese frosting should convince you! Oh yes, that's perfection. 1. Leave a comment, any comment! 5. 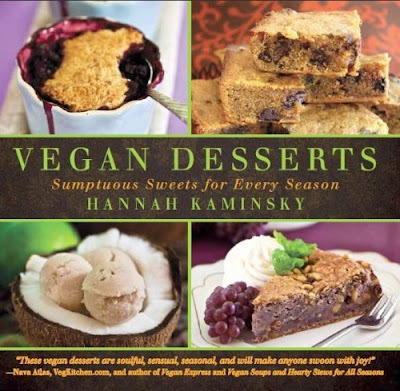 Tweet "Enter to win a copy of Hannah Kaminsky's Vegan Desserts from @ordinaryveg! http://t.co/6z9IZxt"
Good luck! Winner to be announced the first day of summer--Tuesday, June 21 (just in time to make the Peaches and Crème Breakfast Buns, what what!)! Thanks for following along on days 1 and 2, on to our final day in NYC! Our last day in NYC was our engagement photo shoot day! It was only appropriate to start this big day with a big breakfast. We dined on Kate's Benedict at Kate's Joint in the East Village. This dish starts with a thick slice of toast and is topped with vegan sausage, mushrooms, greens, scrambled tofu, and vegan hollandaise. Perfect! After breakfast we started getting ready for the shoot. A friend in Brooklyn set me up with her hair stylist who fixed me up with some beautiful curls. Thanks for the 'do, Dena! Then it was time to head down the road to the Dan Mims' apartment, where we joined by the rest of the team. 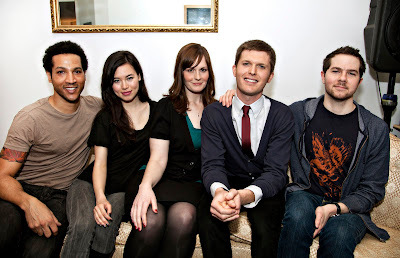 Pictured above on the far left is Christopher Drummond of Christopher Drummond Beauty, my makeup artist for the day. Next to Christopher is Leanne Mai-ly Hilgart of Vaute Couture, my stylist for the day. All the way to the right is Dan Mims of The Ethical Man, our host and Steve's stylist for the day. The lovely lady behind the camera is Erin Nicole of Erin Nicole Brown Photography. Christopher did an amazing job with my makeup, using his own vegan makeup line. I love his products! Leanne helped me decide what to wear for the shoot. It was so much fun to work with her and to get to know her--turns out she is from a neighboring suburb of Chicago! So fun! 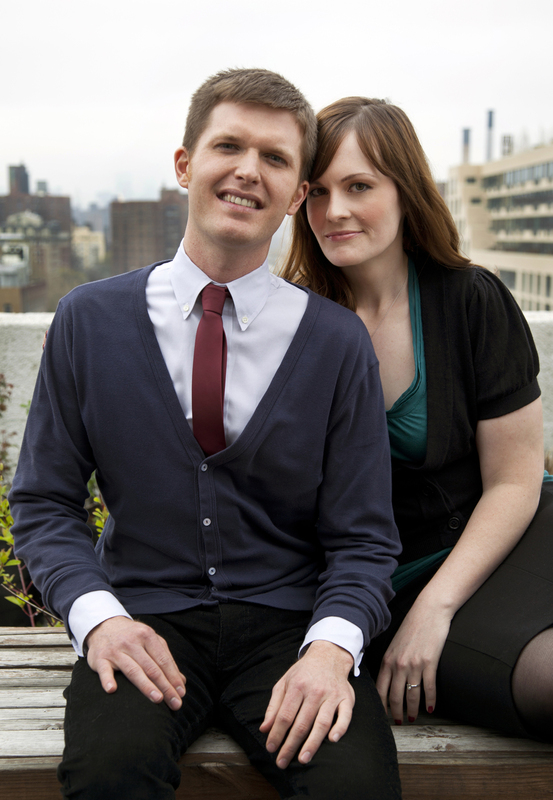 Dan was a most gracious host as we were made up and styled at his apartment, and he did an awesome job styling Steve. The tie Steve wore for the shoot is from his collection. 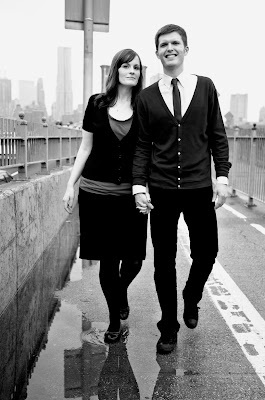 Once we were all styled it was time to hit the streets of Brooklyn for our photo shoot. Featured below are a few of my favorite shots. To see more pictures hop over to Rose Pedals to see the video that they put together which covers our entire weekend in NYC, including some video footage we shot. 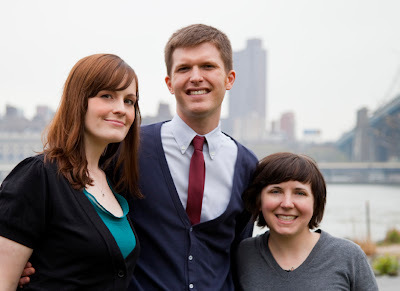 Erin is such a great photographer, she made us feel so comfortable in front of the camera and truly brought out the best in us! Thank you again! 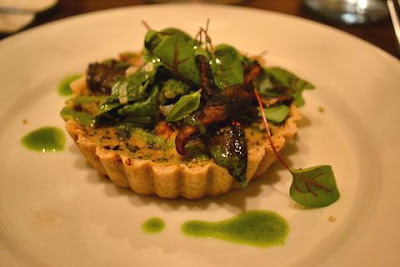 After the shoot we had one more prize to redeem, dinner at 4 Course Vegan in Williamsburg. This was our first experience with underground dining. Underground restaurants, also referred to as supper clubs or closed door restaurants, are set menu dinners held in a private space. Chef Matteo hosts his Saturday night dinners right in his apartment. We had a little trouble figuring out how to get in when we arrived--we stood with a few other newbies at the main door trying to buzz in. Soon someone more experienced spotted us and led us over to a gated courtyard which gave direct access to the apartment. The chef's assistant recognized that our group was not sure if we should wait or seat ourselves, and welcomed us to have a seat anywhere there were empty seats. All of the tables were communal, averaging 10 seats per, with total seating for about 40. It was a full house, so we took the last two seats at a 10-top. From our seats we had a good view of the kitchen where Chef Matteo was busy plating the first dish. At each place setting there was a small card describing the 4 courses for the night. Soon the assistant began serving the first dish. 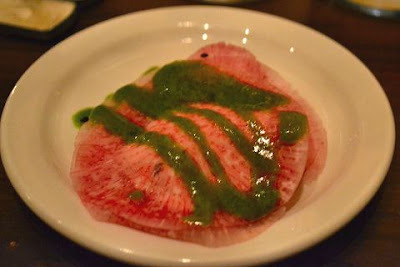 We were given an amuse-bouche of watermelon radish ravioli, before the official four courses began being served. This raw ravioli consisted of two paper thin slices of watermelon radish filled with some type of nut cheese and drizzled with basil puree. I loved this! 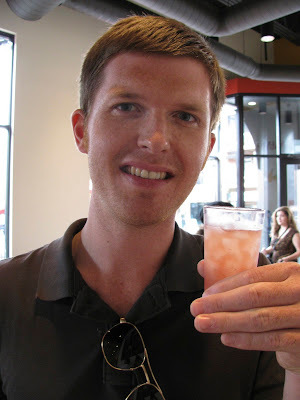 I would love to recreate this and have been on the lookout for watermelon radishes ever since. The first course for the night was yellow spilt pea soup with chile oil and chive sour cream. 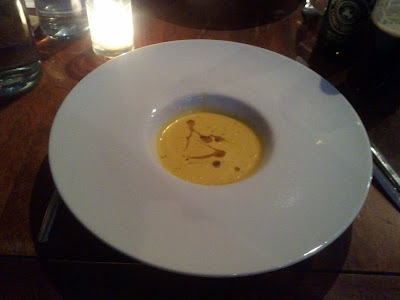 This was a very unique split pea soup, with a distinct sesame flavor as well as some heat from the chile oil. The bowls emptied quickly around our table! 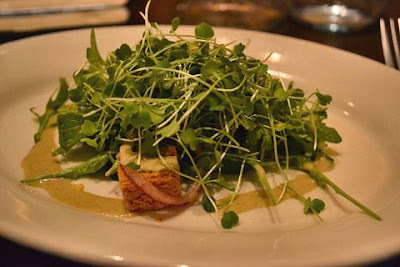 The second course was a baby arugula Caesar with cornmeal croutons and miso-celery dressing. This was a great combination of flavors, though not the most "Caesar-y" vegan Caesar salad I've ever had. Honestly though, I'd take this over the more traditional Caesar flavors any day. The third course, and star of the evening, was the spring vegetable quiche with smokey mushrooms and wild ramps. The crust was rich and perfect, as was the creamy filling. The smokey mushroom topping pushed this quiche over the edge, crunchy and reminiscent of bacon. What I wouldn't give for this recipe! Steve remarked that this was the best quiche he has ever had, and I agree. Just when I thought I couldn't eat another bite the final course was served, pine nut and fennel biscuit with meyer lemon and chocolate mousse. 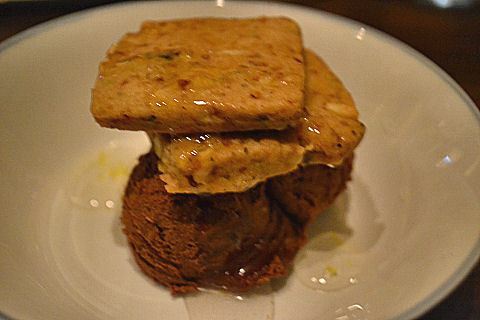 The delicately flavored biscuits were a perfect pairing for the super rich chocolate mousse, which was very thick and heavy. 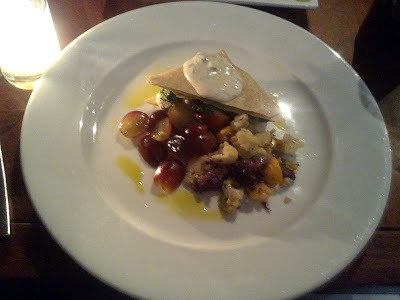 I loved the meyer lemon sauce which brightened and rounded out the flavors. Our first underground dining experience was a success! We had a chat with Chef Matteo before heading out, and thanked him for the fantastic evening. He sent us home with some of his packaged goodies, including an amazing hazelnut toffee brittle and chocolate dipped coconut macaroons. Please do not miss out on dining at 4 Course Vegan if you have the opportunity to! Thanks to one of our tablemates, Dan, for allowing me to use his photos from the night. It had been raining heavily earlier in the day so we decided not to bring out the camera. Dan owns his own underground restaurant in Buenos Aires! 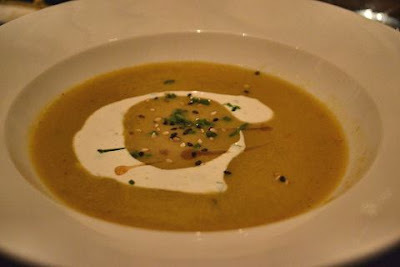 Check out his blog post about 4 Course Vegan, and his resource page with information about underground restaurants all over the world. Steve and I had the best time in NYC, we were very tempted to "miss" our flight home! I cannot thank Rose Pedals Vegan Weddings enough for hosting this amazing contest, as well as all of the wonderful vendors that participated, and everyone that voted for us to win. We will always treasure this experience! Don't forget to check out the feature on Rose Pedals to see the video that she put together, including more of our engagement photos. In case you missed it, check out my NYC Day 1 post. Moving on to day 2! Our second day in NYC started rather deliciously! Steve and I had lunch on the lower east side at Atlas Cafe. Steve chose the Philly Cheesesteak Panini. This sandwich was stacked with seitan, cheesy sauce, lettuce, and roasted red pepper. The bread was awesome, but we rated this sandwich just OK. I made a winning choice with the Vegan Mississippi Chicken Panini. This sandwich features vegan cream cheese, chicken-style seitan, roasted red pepper, and avocado. The combination of flavors was perfect! To be honest, it wasn't the lunch menu that drew us to Atlas Cafe, it was the dessert case. 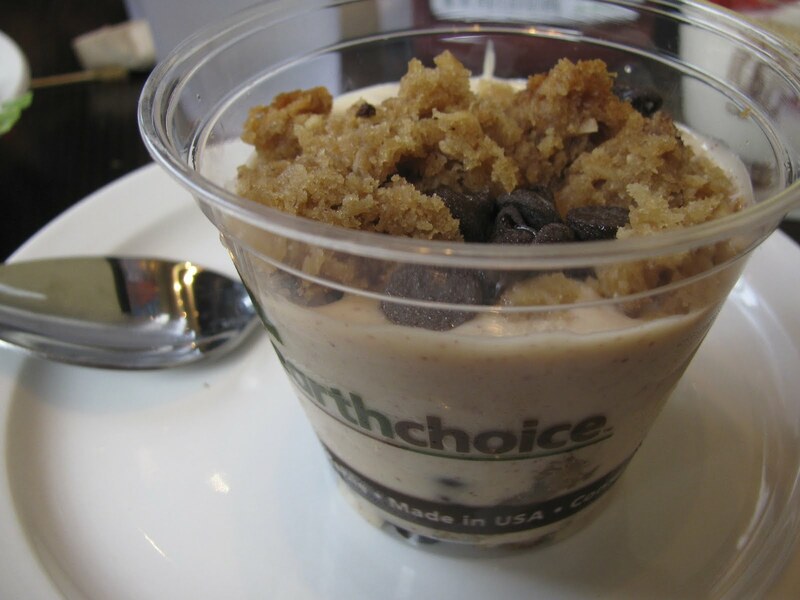 Atlas' desserts are supplied by the popular Philadelphia bakery, Vegan Treats. And when in New York, eat New York Style Cheesecake! This was one rich, decadent, and worthy vegan cheesecake. 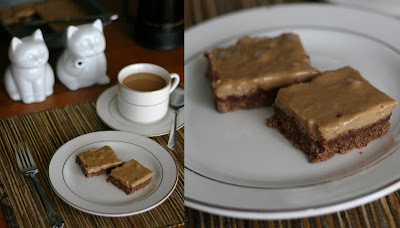 I have read many times about the amazing peanut butter bomb cakes and brownies from Vegan Treats, so I had to snag a brownie when I spotted it. Oh, my! This was my dream dessert, and quite simply, the bomb. 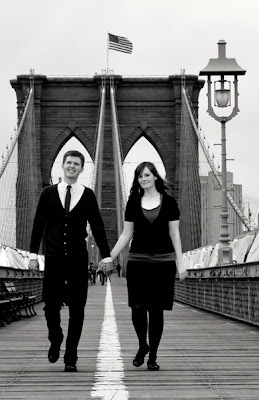 Next, Steve and I headed into Brooklyn to redeem the first prize from the Rose Pedals Vegan Weddings contest. We were treated to vegan manicures at The Green Spa & Wellness Center. Hoping to win Steve over to the possibility of enjoying this kind of pampering with me in the future, I decided to add pedicures to our appointment. Steve only squirmed a little bit and seemed to actually enjoy his first manicure and pedicure! Still, I am not sure he'll be lining up to do it again anytime soon. The spa was wonderful. I loved my manicure, and the pedicure was the best! From the spa we headed back to the lower east side and walked around the rest of the afternoon, working up our appetites to redeem our next prize! That evening we had dinner reservations at the fabulous raw vegan restaurant, Pure Food & Wine. We were informed that we could order anything that we'd like, but the tasting menu was highly recommended so that we could try many things. 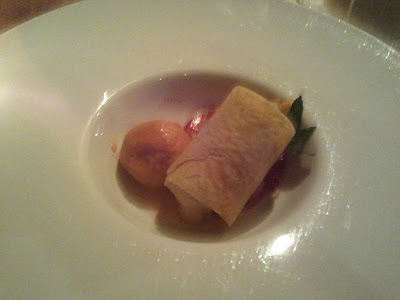 The tasting menu was described as 5 courses, of which we would each receive something different from each other, so 10 total dishes. Our selections for the evening would be made by the chef, which took the pressure off from having to decide between all of the amazing options. It was fun to just sit back and be surprised with the dishes as they came! The restaurant's lighting was not the best for photography. My camera wasn't cutting it without the flash, so we opted to use Steve's phone. The first few shots are a little dark, but we found a better setting after the first few courses. Check out our raw feast! 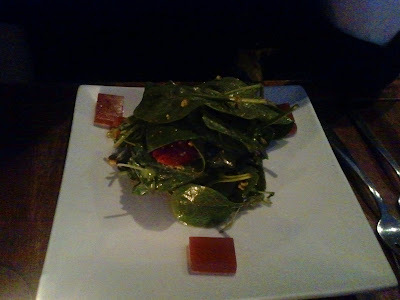 Salad of baby spinach and strawberries with framboise mint vinaigrette, pistachios, and framboise gelee. Steve's salad not pictured: Baby turnip carpaccio with morel mushrooms, english pea cream, spring herbs, and pickled ramps. Kabocha squash soup with clove oil. Spanakopita with spinach, almond feta, cucumber yogurt, with local cauliflower and grapes. 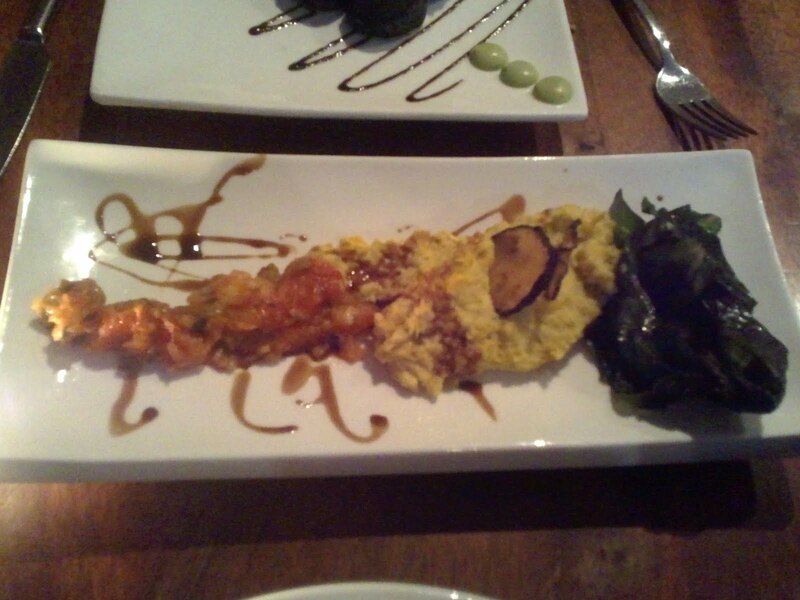 Golden polenta with swiss chard, saffron tomato preserve, eggplant tuille, and oak-aged sherry vinegar. Natsu maki of avocado, pickled red onion, asparagus, baby heirloom carrots, upland cress, with black garlic sauce and wasabi aioli. 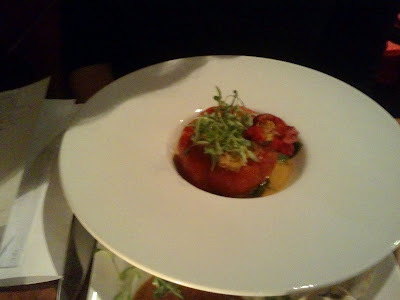 Vine ripened tomato with cauliflower masala filling, wilted spinach, coconut curry sauce, cucumber mint raita. Zucchini and local greenhouse tomato lasagna with basil pistachio pesto, sun-dried tomato marinara, and macadamia pumpkin seed ricotta. 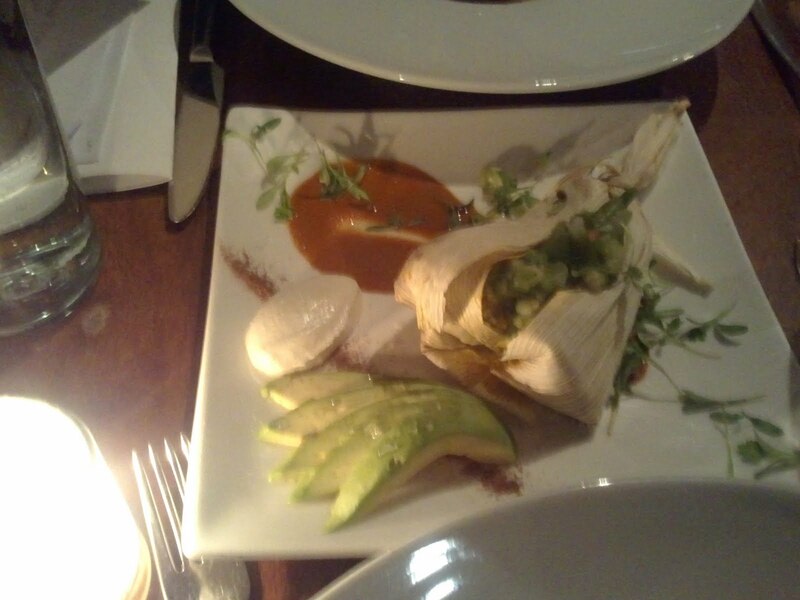 Sweet corn and cashew tamales with chili spiced portabella, salsa verde, cashew coconut sour cream, avocado, and raw cacao mole. This was served between dinner and dessert, but I am not sure what it was. Any ideas? Lemon cheesecake with strawberry rhubarb sorbet, rhubarb and fennel confit. 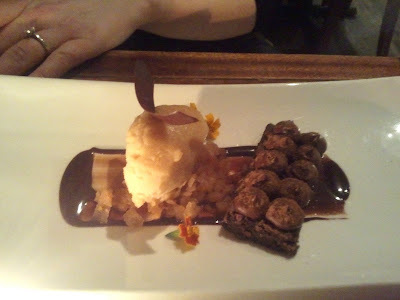 Mexican cinnamon mousse with spiced chocolate cake, pear relish, and pear sorbet. As you can see, they totally spoiled us! 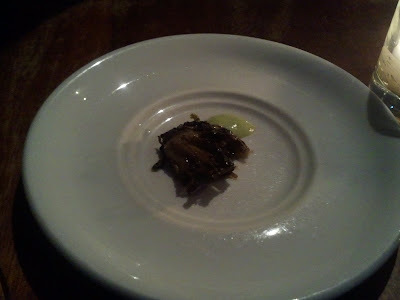 We received an extra entree for both main courses, an unexpected amuse bouche, as well as several drinks not pictured. 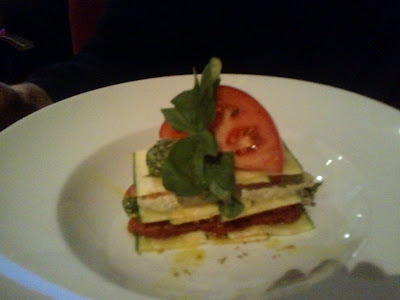 ;) My raw dining experience is very limited, and Pure Food and Wine completely changed my perspective. I could eat like this every day! Honestly, this was the best vegan dining experience of my life. 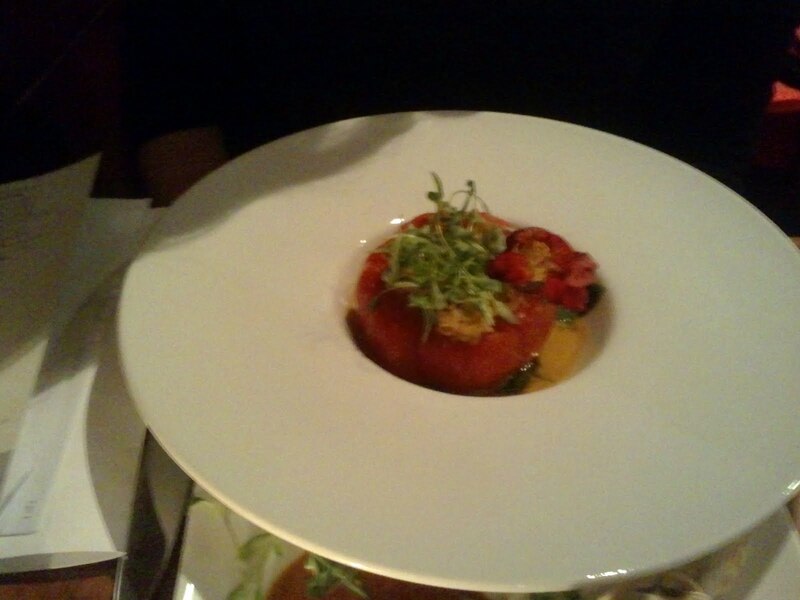 Certainly the most beautiful food I have ever eaten, and equally delicious. It was all good, but if I had to call out a favorite it would be the tamale, with a close second place going to the spanakopita, the kabocha squash soup, and the Mexican cinnamon mousse. Steve agreed that the tamale was his favorite, but the lasagna and the cheesecake were also at the top of his list. As if all of that weren't enough, they sent us home with some One Lucky Duck goodies. 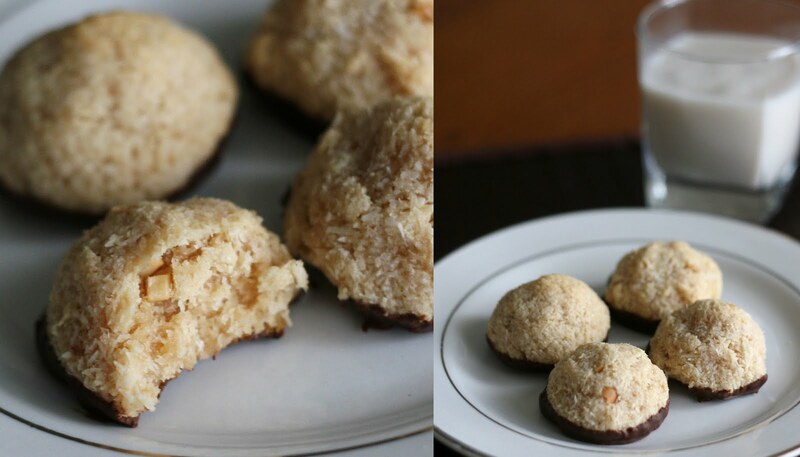 Raw coconut macaroons (like, whoa!) and raw sugar cookies! Thanks again for the amazing night Pure Food and Wine, I am already looking for an excuse to get back to NYC to visit you soon. 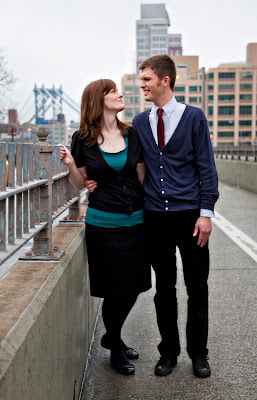 Stay tuned for the final NYC post tomorrow, including pictures from our engagement photoshoot!